Before you can start up a business — any business — customers need to be able to find you. On the Internet, your address is your domain name; the part of an Internet address that comes after the www. With the unparalleled growth of the Internet, dot com domain names continue to sell like hotcakes. Currently, there are more than 80 million dot com domains, and over 100 million total domains registered worldwide. Industry experts forecast that more than 500 million domains will be registered in the next ten years. In fact, reliable sources from companies like Intel are predicting that every personal computer in the future will have its own domain name. In 1998, the dot com craze was beginning to ramp up to unbelievable proportions. So many Internet companies sprouted up in Silicon Valley, and elsewhere, that companies not swept up in the hysteria were thought to be missing out. But, while most people were focused on things like Content, Banner Ads and Bandwidth. 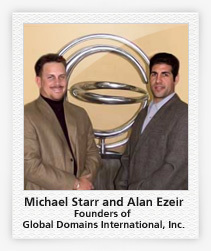 Michael Starr and Alan Ezeir, the CEO and President respectively of Global Domains International, Inc. (GDI), recognized another opportunity that was largely ignored; they wondered, "Besides dot com, are there other extensions that businesses could use as a domain name?" They ultimately focused on the domain extension .WS — which belongs to the tiny island nation of Samoa, deep in the South Pacific. "We thought that the abbreviation .WS could be successfully marketed worldwide as the 'WebSite' top-level domain," said Mike. "There were a small handful of other viable options, but through resolve and perseverance, we found that some countries were already using their domain locally, and not interested in becoming an 'open' or 'global' registry. With a population of less than 200,000 people, Samoa had yet to utilize their domain on a massive scale. And, none of the other countries' domains compared to the potential branding power of .WS to signify 'WebSite'. After all," Mike happily exclaimed, "everyone in the free world knows what a web site is!"